Members of the PSJA Memorial High School marching band perform at the annual 76th Pigskin Jubilee UIL marching band contest at PSJA Stadium on Saturday, Oct. 20, 2018, in Pharr. 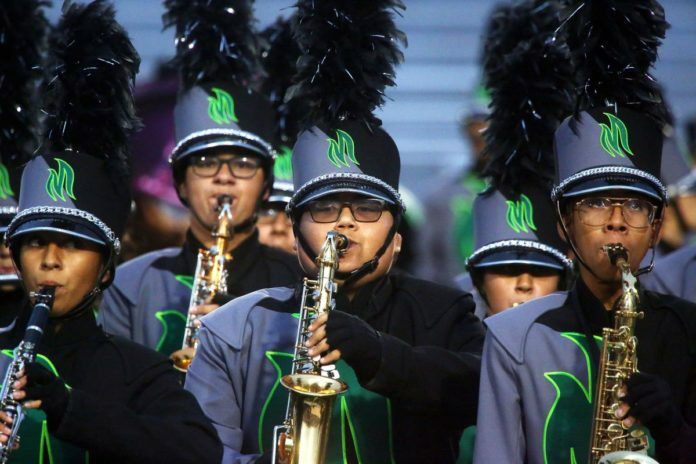 Thirteen high school marching bands waited anxiously Saturday for their turn to perform at the annual UIL Pigskin competition at the Pharr-San Juan-Alamo Stadium in Pharr. For some, it’s been about six weeks since they began practicing the routine. Only 6A and 3A bands are able to advance to the next round this year. PSJA, a 6A band of about 180 students, feels they have the potential to score a 1 out of 5 this year and advance. Tensions were high, but at this point, however, they already have it down, at least according to Drum Major Daniel Heredia. Though they’ve only begun practicing this semester, a lot goes into polishing such a large production. Jon Taylor, director of fine arts at the PSJA school district, said the music is typically chosen as soon as one marching season ends. Then comes the choreography, then props, then weeks of practice. In all, the process takes about a year, and Saturday was the day that they’ve been working toward. John Garza, the PSJA High School band director, feels just about as confident as his students. He has been their band director for three years, when the band consisted of about 80 students, compared to the 180 that are in this year’s show. Later in the evening, his band along with the 12 others would file into sections of the football field and wait for their name to be called, hoping the number one would follow.